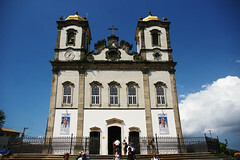 In 2011 a conference on Inclusive Tourism is planned for Brazil. Public announcement will not be until after the March 1-3, 2010 GPDD regional seminar on Inclusive Tourism in southern Africa. In the meantime awareness of Brazil's leadership in adapted adventure sports continues to trickle through the Portuguese/English language barrier. While Eduardo Camara's excellent multi-author blog :Mao na Roda (Hand on the Wheel) is in Portuguese his recent post of videos on adventure sports breaks the language barrier and continues to open the eyes of traveler and travel supplier alike. Some of Toronto's residents with disabilities may soon see their living standards improve thanks to a new partnership between Toronto Community Housing and OCAD. 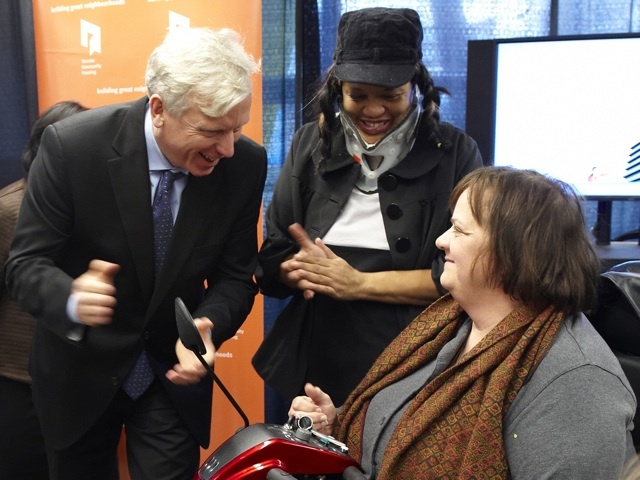 On January 19, the two groups, along with Mayor David Miller, announced that they will be collaborating to research ways Toronto housing can become more accessible through inclusive design. "Everyone will benefit when people with accessibility needs can live independently and with dignity," Mitzie Hunter, chief administrative officer for TCH, told Torontoist. "This work is going to help to achieve that." The creative collaboration will see OCAD students do applied research in the Moss Park area, speaking to residents with disabilities about the challenges they face. Specifically, the students will be looking at approaches to wayfinding and navigation systems in common areas, according to Cheryl Giraudy, associate dean of OCAD's Faculty of Design. Their findings will result in planning and implementation strategies that adhere to the Build Environment standards of the Accessibility for Ontario with Disabilities Act of 2005. It's TCH's hope that these strategies will apply to their broader portfolio of housing around the city, which includes more than 350 high- and low-rise apartment buildings. The biggest challenges, according to Doreen Balabanoff, acting dean of the Faculty of Design, will be "making sure that inclusive design actually responds to the rich set of needs that a diverse community represents--who is being forgotten or left out? What abilities or disabilities are we missing in our considerations? And, as with all design challenges, are we asking the right questions?" Mayor Miller, Toronto Community Housing tenant Tracy Izzard, and Toronto Community Housing Health Promotion Officer Penny Lamy spoke at the announcement of the partnership between Ontario Community Housing and OCAD on January 19. Photo by Lino Ragno. Hunter said TCH opted to partner with the Faculty of Design at OCAD because of its rich history of innovative talent and emerging designers with fresh perspectives, and also because of its impressive curriculum in the area of universal and inclusive design--like the first-place winner of the 2008 OCAD Design Competition. The competition, which challenged students to develop inclusive/universal design solutions, was won by "Pathways," an inclusive wayfinding concept designed by OCAD students Rizwan Ali, Lesley Look Hong, Emily Oppenheim, Finlay Paterson, and Steve Reaume. "The work under the umbrella agreement," Giraudy says, "will touch all levels of our design program offerings, including independent and field studies, courses with embedded research, paid research projects, and thesis work for students who want to specialize in universal and inclusive design as part of their major program or area of study." The students will make recommendations in the form of a design guideline in late 2010, to be followed by a prototype in 2011. It's a start to making Toronto a more inclusive place to live. The International Conference INVTUR 2010 - Tourism Research: State of the Art and Future Perspectives is fast approaching. This will be the largest tourism-related scientific conference ever held in Portugal. The conference offers you the possibility to choose from 170 communications, distributed in 35 thematic parallel sessions, and 27 posters, being involved more than 350 authors that come from 25 countries, which will bring us a great diversity of cultures and experiences. All the works will be published in a special issue of the Journal of Tourism and Development, divided in 3 volumes. INVTUR 2010 will host keynote presentations of some of the most important figures of world tourism academy: Professors Chris Cooper, John Tribe, Dimitrios Buhalis, Geoffrey Wall, Alan Fyall, Jafar Jafari , Lionello Punzo e Alfonso Vargas-Sanchez. You will also be able to visit BiT - Forum for Tourism Innovation. This event will set as a priviledged space for the presentation of public and private organisations that represent successful and innovative cases and best practices developed on tourism projects, business models, and planning and management. Check conference full program in attachment (also available on INVTUR website on http://www.ua.pt/event/invtur2010/ReadObject.aspx?obj=13183). The famous coral pools of Paju?ara, in Maceió, are about to become more accessible to travelers with disabilities. A wheelchair-accessible jangada - the typical sailboat of the Brazilian Northeast - is to be launched at the end of January. Designer Jorge Luiz Silva and supporters hope to collect funds to build three more jangadas. I'll be posting the bank account as soon as I have it. Read more about the accessible jangada. DCMS has launched "Accessible tourism: Making it work for your business" on behalf of the Accessible Tourism Stakeholder Forum for the 2012 Games. It sets out the business case for accessible tourism and the economic potential in providing better services and encouraging more tourism from disabled people. It was launched by Margaret Hodge, Minister for Culture, Creative Industries and Tourism on 25 January 2010. To position Mozambique as one of the premier destinations in Africa through emphasis on quality coastal resort development linked to a diversity of flora and fauna, eco-tourism opportunities, adventure and culture experiences. Inclusive Tourism and Inclusive Destination Development take a fundamental stance regarding what constitutes quality. That stance is right in the name - Inclusion. These approaches to tourism are inseparable from the seven goals and seven principles of Universal Design. Universal Design is a human-centered design process that involves user-engagement at all stages. Quality of the tourist experience is safeguarded through that continuous feedback system embedded within Inclusive Tourism and Inclusive Destination Development. Universal Design arose from within the Disability Rights Movement, has been nurtured by disability culture(s), and expresses a consensus political position on the goal of full social participation by all persons experiencing disability. However, Universal Design evolved in a land-based environment. Application to maritime and coastal environments provided an opportunity to further focus the approach by taking into account the unique characteristics these new settings. The result has been the Waypoint-Backtrom Principles of inclusive maritime environments. Tourism embraces several complementary and converging concepts offering guidance toward responsible and ethical industry and consumer practices. Geotourism is one such concept. It has been shown to be fully compatible with Inclusive Tourism and Inclusive Destination Development through projects such as the Ashoka Changemaker / National Geographic Geotourism Challenge. Increasingly adventure tourism has become a popular incubator of innovation regarding inclusion of people with disabilities. The therapeutic effects of adventure sports have been demonstrated by Dada Moreira of Aventura Especial resulting in extensive MinTur support in Brazil. Private enterprise such a Parque dos Sonhos in Socorro, Brazil and active promotion by the Brazilian Adventure Society make adventure sports a hallmark of the Lusophone world. The vitality of the large number of recent disabled war veterans combined with new rehabilitation technologies are another contributor to the rapid rise of adventure sport and tourism for people with disabilities. The UN Convention on the Rights of Persons with Disabilities establishes the freedom to participate in travel and tourism as a human right. Governments increasingly recognize full participation in all aspects of a nation's culture as fundamental prerogatives of citizenship. To lesser extent recognition has been achieved on the contributions provided to society by individuals with disabilities and the various cultures of disability in which they participate. The full participation of persons with disabilities and their organizations is becoming recognized as necessary to the diversity of culture. What follows is a July 2009 presentation that includes the above statement of Mozambique's tourism priorities. It was presented by Minister Fernando Sumbana Junior. Está em fase de produ? ?o mais uma pe?a gráfica do Programa Aventura Segura. Participe e conte sua experiência! O Manual de Orienta? ?es para Acessibilidade no Turismo de Aventura trará informa? ?es sobre empresas e profissionais que oferecem servi?os de Ecoturismo e Turismo de Aventura referentes ao atendimento de clientes com deficiência ou com mobilidade reduzida, estimulando a implementa? ?o de recursos para a acessibilidade dessas atividades no Brasil. O manual servirá também como ferramenta para orientar a adapta? ?o dos recursos e servi?os das atividades de aventura, com base na Norma Técnica "ABNT NBR 15331 - Turismo de aventura - Sistema de gest?o da seguran?a - Requisitos". O Manual será disponibilizado na íntegra para download no site Aventura Segura (www.aventurasegura.org.br) e a vers?o impressa será distribuída nos principais eventos do segmento a partir deste ano. El Consejo acepta los terrenos cedidos por el Ayuntamiento para llevar a cabo el proyecto, que supondrá una inversión de 2,5 millones. El CAP-Andalucía fomentará asimismo el denominado ′dise?o universal′ en productos y servicios de consumo general, con el fin de lograr la máxima utilización por parte de estos colectivos. Sus actividades investigadoras se realizarán en colaboración con universidades y entidades y organizaciones sociales. La Junta de Andalucía invertirá 2,5 millones en la construcción del Centro Andaluz de Accesibilidad y Autonomía Personal (CAP-Andalucía), que estará ubicado en Córdoba. El Consejo de Gobierno acordó hoy aceptar los terrenos cedidos por el Ayuntamiento de esta ciudad para llevar a cabo el proyecto, que se licitará en breve y cuyas obras se iniciarán el próximo a?o. El futuro centro, que se construirá en una parcela de 6.000 metros cuadrados en la calle Victoria Kent, dará respuesta a la creciente demanda de servicios especializados de información, asesoramiento, documentación, formación sobre ayudas técnicas, productos de apoyo y adaptaciones del hogar para mejorar la calidad de vida de personas con discapacidad o en situación de dependencia. El CAP-Andalucía fomentará asimismo el denominado ′dise?o universal′ en productos y servicios de consumo general, con el fin de lograr la máxima utilización por parte de estos colectivos. Sus actividades investigadoras se realizarán en colaboración con universidades y entidades y organizaciones sociales. Otra de las funciones del centro será la de prestar asesoramiento y apoyo a los ayuntamientos andaluces en la implantación de planes de accesibilidad. La Consejería para la Igualdad y Bienestar Social ha venido apoyando económicamente esta iniciativa, que en la actualidad desarrolla o tiene en fase de elaboración más del 78% de los municipios andaluces. Entre otras instalaciones, el CAP-Andalucía contará con departamentos de arquitectura, transporte, comunicación, informática, documentación, I+D, terapia ocupacional, lengua de signos y medio de apoyo a la comunicación oral, así como biblioteca, sala de exposiciones y espacios de formación. Greetings from i-CREATe 2010 Organizing Committee! We are glad to introduce to you i-CREATe, an international conference and exhibition dedicated to promote quality independent living for the elderly and people with disabilities (PWD) through technological solutions. Kindly visit the link below for the Call for Paper details. Thank you for your support in the convention and your promotion of worldwide technical exchanges in ART. We look forward to hearing from you soon and meeting with you at i-CREATe2010, Shanghai China. No, Tell Me This Didn't Really Happen! It seems that a paraplegic businessman checked into a hotel and his colostomy bag broke during the night, spewing waste all over the bed. An accident. He paid the damages for clean-up. The hotel apparently banned the guest for life - specifically because of the soiled linens. The International Association for Universal Design will organize a conference in Hamamatsu City, Japan. UNESCO's annual Global Monitoring Report on Education for All, "Reaching the Marginalized", released today, warns that the global economic downturn risks creating a generation of children whose lives have been irreparably damaged by being denied their right to education and identifies children with disabilities as amongst the most vulnerable. "The key message to emerge is that failure to place inclusive education at the centre of the EFA agenda is holding back progress". The report describes an "inclusive education triangle" consisting of the learning environment, accessibility and affordability and entitlements and opportunities and recognizes that for quality education governments need to revise their approaches to teaching, learning and curriculum development. It also points out that "ability groupings", or streaming students according to academic achievement seldom help the marginalized. Diane Richler, President of Inclusion International commented, "We are pleased to see UNESCO recognize that unless education systems are transformed to include all children, including children with disabilities, the goals of Education for All can never be reached." However, the report fails to address the fact that in many countries social ministries rather than Ministries of Education are responsible for children with disabilities. "Until there is one ministry and one school system responsible for all children, inclusive education will remain a dream." she said.
" Misty Mount lodge, built in 1937, served as one of the earliest camps for people with disabilities [in the US] and The League for People with Disabilities continues to use the Catoctin facilities to this day." Nestled an approximate 90 minute, northwesterly drive from DC, Catoctin Mountain Park located just outside of Thurmont, MD, is a great spot for a day trip or the perfect location for a weekend getaway from the district's hubbub. I've long had Catoctin on my radar since moving the DC, in fact visiting the national park is one of my New Year's resolutions. And while I wouldn't consider now the perfect time to visit the park, I'm of the spring/summertime hiking ilk, the park is definitely still opened to hikers, drivers and visitors, although you should check the park's website prior heading out for closure updates, and is well worth the effort. Cruises and resorts suffer from the same moral difficulties as sweatshops. On one hand, the symbolism behind impoverished workers slaving to provide luxuries to Western consumers is repulsive, while on the other hand, those industries are vital to the economies of developing nations. Guardian columnist Gwyn Topham points out that Friday's visit was really just business as usual -- the only difference was scale. "Tourism provides a microcosm of modern globalized inequality, with all the advantages or injustices it bestows on those on different sides of the divide," he wrote. "From the Caribbean to Southeast Asia, cheap labor and land allow holidaymakers to relax in style for less." well-known choreographer? This is your chance! ?AXIS Dance Company. Photo by Andrea Basile. where we will scout for Community Cast Members. you have a disability. This is an unpaid position. Ticket info: tickets available at the box office 1 hour prior to curtain. Caminhar no mato parece a coisa mais natural do mundo, pelo menos desde que nossos ancestrais desceram das árvores e adotaram esta postura instável, que nos condena a problemas de coluna e, em troca, libera os membros superiores para tarefas mais elevadas - como estapear mosquistos ou empunhar o telefone celular para fotografar cada passo da jornada. Mas, apesar da aparente naturalidade, andar no mato é uma inven? ?o recente, que no Brasil ainda depende muito de empresas especializadas e guias meio fanáticos, que apontam o caminho das trilhas como se elas fossem a estrada de Damasco. E basta um dia de enchente humana num parque nacional para ver o bom servi?o que eles prestam. Sem seu fervor evangélico, as picadas estariam às moscas. Ligando geralmente o nada a lugar nenhum, elas dependem, para ter algum tráfego, da "caminhada romantica", moda que, segundo o historiador Simon Schama, nasceu no século XIX e tem autor conhecido. Chamava-se Claude Fran?ois Denecourt. Antes dele, só se ia ao mato para derrubar árvore, matar bicho ou fugir da cadeia. Denecourt foi retratato pelo literato Theophile Gauthier como "um homenzinho vestido com simplicidade, portando um chapel?o e óculos, segurando o galho de azevinho que lhe serve de bast?o para subir a encosta". Ninguém se iluda. Seu despojamento era grife, sua fantasia de "Le Sylvain", o gênio da floresta. A Nike, a Columbia, a Patagonia e outras etiquetas do ramo só viriam aprimorar o figurino dos caminhantes muitas décadas depois. Denecourt foi, basicamente, um comerciante de conhaque em Fontainebleau, nos arredores de Paris. Ferido nas guerras napole?nicas, coxeava. Embora manco, era um andarilho infatigável, treinado em marchar por anos a fio de um lado para outro da Europa no 88o Batalh?o de Infantaria Ligeira, com as campanhas do imperador. Ao dar baixa, conheceu a floresta de Fontainebleau quando ela caía aos peda?os. Fora uma reserva de ca?a real, tratada como terra de ninguém na Fran?a revolucionária - mais ou menos como por aqui, à falta de governo, fazem os grileiros da Amaz?nia. Desmatada, defaunada e invadida, Fontainebleau sobreviveu aos tropic?es da política francesa só porque Denecourt promoveu sua reciclagem como lugar de passeio. Ele abriu pessoalmente 300 quil?metros de picadas na floresta. Batizou itinerários, árvores e pantanos. Transformou em refúgios rústicos as cavernas. Sua influência chegou até a concep? ?o original do Central Park em Nova York ou, para ficar mais perto, à Floresta da Tijuca, no Rio de Janeiro. Aliás, todo jardim do paisagista Auguste Fran?ois Glaziou, que reinou na corte de D. Pedro II, n?o deixava de ser uma espécie de miniatura da Fontainebleau de Denecourt. Fontainebleau, onde Deneccourt é nome de rua e tem estátua en pra?a pública, está cada vez mais cercada por 24 mil hectares de velhos bosques preservados, desde que, no rastro de Denecourt, foram parar lá, de carruagem, os gr?-finos do Império. Com eles pintores, toda uma gera? ?o que arranchou no vilarejo de Barbizon, num canto do bosque, e cevou ali uma escola de paisagismo que serviu, nos Estados Unidos, para inspirar a decreta? ?o dos primeiros parques nacionais. Em resumo, os guias de ecoturismo que n?o nos ou?am. Mas caminhar no mato n?o é coisa que se nas?a sabendo. é algo que se aprende. Como todo passo civilizatório. Does how private homes are built affect tourism? You bet. In part, because countless people who would have taken trips to visit relatives and friends , stay home instead. Four-day family vacation at my sister's house in California: Ten of us--adult sibs and spouses. We hiked the trails winding above the Pacific, and ate in a seafood restaurant. We went to the John Steinbeck museum in Salinas, and ate lunch at a local diner. We rode the rapid transit system into San Francisco, shopped and dined in Chinatown. We toured the historic mission in San Juan Bautista and had lunch in an outdoor café under an arbor in a flower garden. We had a wonderful time reminiscing, joking, catching up. And we spent a lot of money. Ordinary tourism. Ordinary except that none of this would have happened if my sister's house had not had a ramp and renovated bathroom due to her husband's progressing Multiple Sclerosis. I, meanwhile, have used a wheelchair since having polio at age three. Now , at age 65, I was no longer the buff young woman who could toss her wheelchair behind her into the back seat of a car and drive off, and could be carried up steps into houses in a manual chair if need be. I use a power wheelchair and must have a ramp to enter houses that have entry steps. So my sister's accessible house was the choice for our reunion. Had the house not had access, I would not have been present. Nor would my brother-in-law with MS have been able to exit his house without extreme effort (and no, not all people with mobility impairments are able to obtain the renovations they need in their home. Perhaps 2/3 of them remain dependent on the schedules, abilities and whims of others to exit their own homes.) It is unlikely the California reunion would have happened at all if the house had lacked access. What's the relation between private home access and disability? I think no one has yet researched the vast amount of tourist dollars NOT spent because people with mobility impairments can't enter the houses or use the bathrooms in the houses of their far-flung adult children, siblings, friends... or can only do so with great difficulty. In fact, my non-disabled sibs often use my Kentucky sister's house as an overnight stop-off and enjoyable visit while travelling from Indiana or Florida. But I, and my would-be travel companions, do not. Her house has 5 steps up to one bathroom and five steps down to the other. I don't fault my Kentucky sister for buying the house that was well located and priced right for her and her family. We can't renovate all the existing houses that lack access, an estimated 124 million houses in the U.S alone. But we can stop building new houses with the same barriers. That's what the movement called Visitability (or Inclusive Home Design, or Basic Home Access, or Core Universal Design) is about. And it has been at least a little effective in getting houses built with basic access whether or not a known first resident has a disability. For information about this movement, see www.concretechange.org. Disability Resource Exchange (DRE) is a social network created by Rudy Sims, a 31-year-old man from Teaneck, New Jersey, who was born with cerebral palsy. You can find it at www.disabilityresourceexchange.com and its name says it all. As one may find in its home page, "Disability resource exchange is a place to discuss disability issues and exchange resources ideas and support". For that, Rudy intends "to bring together all those interested in disability issues, both people with and without disabilities", as well as "organizations within the disability community", making this network "a place with a supportive atmosphere, where we can all learn from each other". He explains his goal: "I want the community to be a very supportive and positive place. I am trying to foster an environment that encourages understanding and knowledge exchange, even from people with very differing opinions." 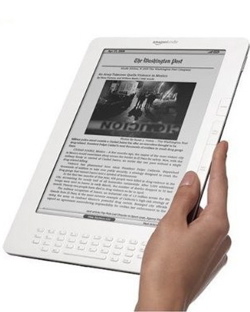 Jan 14: Three US universities have agreed not to use Amazon's e-book reader the Kindle until it is easily usable by blind people. A fourth settled a complaint from blind people's advocacy groups by saying that it will strive to use accessible devices in future. Though the Kindle DX reader can read out text, making it potentially useful to blind people or those with low vision, it offers no way to navigate its controls and menus that is accessible to blind users. A Conferência INVTUR 2010 - Investiga? ?o em Turismo: O Estado da Arte e Perspectivas de Futuro, aproxima-se muito rapidamente !!! Esta vai ser a maior conferência científica alguma vez realizada em Portugal na área do turismo. A conferência oferece-lhe a possibilidade de poder escolher entre 170 apresenta? ?es, 27 posters, envolvendo mais de 350 autores. Decorrer?o 35 sess?es paralelas temáticas . Os autores s?o oriundos de 25 países, o que acrescentará uma riqueza e diversidade de culturas e civiliza? ?es invejáveis! Tudo será publicado num número especial da Revista de Turismo e Desenvolvimento, repartido em 3 volumes. O INVTUR 2010 contará com a participa? ?o de alguns dos vultos mais importantes da academia mundial do turismo: Professores Chris Cooper, John Tribe, Dimitrios Buhalis, Geoffrey Wall, Alan Fyall, Jafar Jafari , Lionello Punzo e Alfonso Vargas-Sanchez..
No ambito do INVTUR 2010, poderá ainda visitar a BiT - Bolsa de inova? ?o em Turismo. Este evento vai afirmar-se como um espa?o privilegiado de apresenta? ?o e divulga? ?o de empresas e organiza? ?es públicas e privadas que representam casos de sucesso, inovadores, e que se revelam como boas práticas desenvolvidas ao nível de projectos, modelos de negócio, gest?o e planeamento, aplicados ao sector do turismo. Consulte o programa científico da conferência em anexo (também disponível no site em http://www.ua.pt/event/invtur2010/ReadObject.aspx?obj=13183). Fa?a já o seu registo na conferência em: http://www2.adm.ua.pt/sre/gesconf/registration.asp. 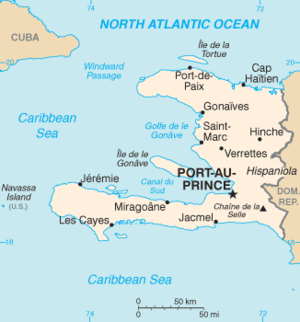 You Can Help Injured Haitians. Thousands of Wheelchairs Are Needed. After lifesaving medical and rescue efforts are completed, thousands of Haitians will need durable wheelchairs capable of navigating the rough debris covered terrain. This kind of environment is exactly where our chairs excel. Disability disaster response and recovery expert George Heake has described the RoughRider wheelchair as "ideal" for Haiti after the earthquake. With an estimated 200,000 dead, we can be sure many more will become permanently disabled. It's heartwrenching to know that even more people will become disabled due to the lack of immediate medical care. Whirlwind Wheelchairs will rush the production of RoughRiders from our Mexico factory and possibly from our other regional partners if funds are made available. For this first order we need $22,000. For $220 you can provide a good wheelchair that will help an injured person return to normal life. To make a donation online at Whirlwind. The Commission has asked the Government to set out in detail its proposals and the evidence to justify profiling and the introduction of body scanning equipment at airports, in a letter sent to the Home Secretary. The Commission fully accepts the Government's responsibility to protect the safety and security of air travellers but is concerned that the proposals to introduce body scanners are likely to have a negative impact on individual's rights to privacy, especially members of particular groups including disabled people, older people, children, transgender people, women and religious groups. Under the Human Rights Act, any infringement of the right to privacy must be justified, necessary and proportionate. The Home Secretary has also raised the issue of profiling in the context of selecting people for scanning. The Commission has serious concerns that the practice of profiling is likely to lead to selection of people on the grounds of race, ethnicity or religion. Such selection is discriminatory, contrary to domestic legislation and international standards, and is harmful to community relations. The Commission notes that the Home Secretary has said the Government recognises these concerns and the need for further careful consideration of these issues. However, the Commission considers that the Government should proceed with the utmost caution and fully evaluate whether implementation of such policies can be carried out in a way that does not amount to unlawful discrimination. The death of my father on January 3, 2010 has slowed the publication schedule at Rolling Rains. com. Today is his funeral. I offer the following eulogy in his honor. My gratitude to all those who have supported me (even when they were not aware they were doing so) in the past year as Francis C. Rains reached 90 years old and rapidly failed. Anyone who came here expecting only a bunch of sad people moping around needs to check the address on their invitation. You came to the wrong place. This is a celebration of a life and the promise of what comes after! Five minutes before he died Dad's eyes became bright as a young man's. He fixed his gaze on the distance as if he saw someone he recognized. He smiled. He closed his eyes. He took a last breath. I imagine him not slipping but striding into the next life. After all it was only three days earlier that he sat up in bed and said urgently, "I need to put my socks on. My brother is coming to for me." "May you reach the Pearly Gates a half hour before the devil knows you left!" I have no doubt Dad was there in record time but here's the rub. Pearly gates, a city with streets paved of gold, folks in long white robes instead of lederhosen and hikin' boots. Hmmm, I think he'd slip out of line and head down the first trail he found outside the walls. Then he'd strike out on a hike. Dad didn't die with his boots on but he was buried with them - and with an elk antler from his hunting buddy Jerry Gillis. Now those who do the math will figure out that Dad didn't meet Jerry until several years after Dad last went hunting. Doesn't matter. Dad had a charm, a wit, a passion, a way with stories, and an innocence that could make him hunting buddies with someone he never spent a night in the woods with. To spend a night - or even an afternoon - in the woods with Dad was to be close to God. People have noticed that "guys" seem to need to be doing something else in order to bond -- tinkering in the shop, watching a ball game, chopping wood. To step onto a trail with Dad was to meet a man who would you wanted to bond with. Handsome even from his younger days, strong, confident, knowledgeable of his surroundings, and skilled in surviving in them he made you feel safe; glad to be there. And that was just the surface. To walk more than a few paces down a trail with Dad was to watch him turn inside out. All those outward-facing traits became the core; the skeleton. Over that emerged a skin with a vulnerable attentiveness - the kind that is difficult to risk in the presence of others. In that vulnerability even God overcame His/Her usual shyness and became more than usually present. Even God couldn't resist Frank's love of creation. Dad would fiercely enforce silence on us as we hiked. He said it was so that the animals would come out. We rarely saw the animals we hoped for but he taught us to see whatever did reveal itself - plant, animal, mineral, weather, vista, passing hikers - all with an immediacy that was life-changing. We always saw a man who came alive in the woods. It fed us. It was the sacramental moment of Frank's spirituality. This attentiveness had a history though. It was nicked and scarred. Dad served his country in the US Coast Guard from before World War II until afterward. He was there when Douglas MacArthur, as he would, "got his boots wet", at Leyte Bay going ashore after the Battle of the Philippines. Dad told the story of a man standing next to him being blown to little pieces that then clung to Dad's clothing He told the story of a car backfiring years after coming home where the next thing Dad was aware of was looking up from the ground. He had flung himself there on instinct trained by five years of war from the Atlantic to the South Pacific and finally to the Bering Sea sailing with the Russian Navy. Mom once confided in me that she had watched the best and brightest men of her generation damaged for life by war. She cited her brother shot down over Borneo and picked up by headhunters but indirectly she was trying to tell me something about Dad. Dad explained to me when I was teenager that he carried a gun in the woods to overcome his fear of guns - and probably the guilt over the men's lives he had ended with them. Dad was a hunter but his favorite story was about the "one that got away." Once he came up on a buck deer with a trophy set of antlers. Dad brought up his gun. Sited a perfect shot. (He was a first class marksman with Boeing's Gun Club even decades after the war.) Then he looked up from the scope right at the deer and said, "Bang!" The buck sprung away. Dad went home a little closer to healing. Dad came home to the woods. There he was transformed. Wilderness made more sense than civilization to him yet, paradoxically, he drew the deepest lessons of society from wilderness. He took on a magnitude of personal responsibility and taught a code of ownership for one's actions that shaped not only his children but a generation of young men he raised in Boy Scout Troop 290. I tell my friends that my mother taught me religion and my father taught me to pray. Those who knew him in one of his families - with Gracie, with Lois, or with Dee - know how endearing he could be. Those who also knew him as a hiking, camping, or hunting buddy got to touch his greatness. Dad had a knack for attracting "Number Two-and-a-half Sons" like Mark Milachek and Jerry Gillis but he was also father to my ski buddies like Vern Peterson and my first best friend Pat Weible. I can still picture Pat hanging on the gate to our back steps the day we moved into our house in West Seattle in 1959. Dad seemed to be getting a little irritated. There was this 6 year-old limpet clamped to the gate. He swung with every moving box that passed by. Knowing Dad's feeling that family means everybody pitching in he probably was wondering why Pat didn't get with the program and sign himself up for some chore like hefting boxes. Even then I knew I had found a friend for life. As Pat pelted us with questions he erased the boundaries between his family and mine. Last weekend I sequestered myself out at Kalaloch to gather my thoughts in a rustic environment where the excellent staff accommodated my disability with five-star quality. As I prepared for that trip I knew I could invite Pat along as the kind of friend to be both together with and alone with at the same time. Years of our families camping together, sharing holidays, fighting, and dreaming make me very grateful that Pat, Terri, and Paul Weibel were able to make it today. It feels like family. Dad had a special fondness for my spouse Patricia. Sometimes it was embarrassing but I think he was trying to teach me from his own experience how not to let my love for her grow cold. He never tired of telling the story about how we "fell for each other" in the front yard but I think I'd steal Patricia's thunder if I retold it now. Dad liked to tell the story about hearing us laugh together just like mom liked to tell the story about seeing Patricia take charge once when we visited before we were married. Mom knew that a son who inherited the full genetic complement of Frank's stubbornness - supplemented by a lifetime tutorial from him in how to use it to full advantage - needed a friend who was stronger than the average person. Patricia has been more supportive and forgiving of me than anyone ought to be asked to be. Thank you. Over more than a decade Dad has loved and been loved by Dee McClellan, her children and her grandchildren. You were as close to his heart as his biological children. He kept us constantly updated on your lives. His pride in you was real. His wonder at being welcomed into your love as family was the surest sign I had that he had won his inner struggle and made a decision to continue living after mom passed away so young. Thank you for being here today and thank you for surrounding him with love all those years. It extended his life. In his last months Dad found a new home. I knew it was a fit when Dad asked the two adult day home staff fluttering around him, "What language are you ladies speaking?" As quick as he could call up that deadpan look that he kept ready for such occasions he said, "Ni ponimayu!" That's Russian for, "I don't understand." Even quicker one of the ladies quipped, "Oh, ponimayu, ponimayu. You don't fool me. You know exactly what we're saying!" Mariya, Marika, and Chuka lost a good friend in Dad. Dad started a new friendship just days before he died. I guess you could literally say it was a friendship made on the doorstep of heaven. Newborn Lila Grace met Francis Clarence Rains when words were failing him but love was not. 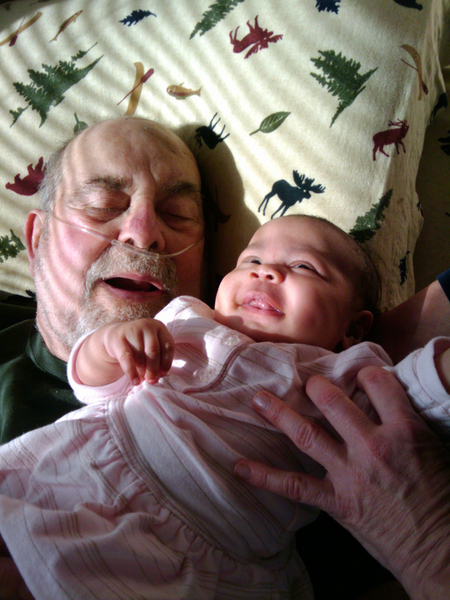 The beautiful smiles of great grandpa meeting newest great granddaughter made one of the most touching photos of Dad I have ever seen. It is appropriate to celebrate Dad's life in the land of the Duwamish with a final potlatch. After this memorial we will distribute to the younger generation the collection of stuffed animal toy birds that grew around him because friends and family brought these memories of the outdoors to him at home. As we turn Frank over to the Trinity and to all who have gone before us I want to say thank you to Dad and thank you to you for listening to my story. It takes a long time to tell a man's story - more time than we have here today. However, I hope this short story was long enough to tell a man's truth. As Universal Design becomes increasingly well known and the ICF's definition of disability as an interaction between functionality and environment is accepted it becomes necessary to systematize methods for application of the principles and goals of Universal Design to the creation of real products. The Cambridge Engineering Design Centre strives to meet this need with such projects as Understanding Diversity in User Characteristics. Design accessibility describes the performance of a product in terms of its utility, usability and accessibility as measured against its intended user population. Despite the obvious sense in designing accessible products, it is well known that too many products are targeted at young able-bodied users. As a result, they are neither accessible nor desirable to the older user and, in practice, able-bodied users often find them difficult or frustrating to use. Hence, significant effort is planned to develop approaches to design that will challenge this traditional design practice. The vision of the Inclusive Design group is to embed inclusive design thinking in the UK design and retail community, thus enabling the design of more inclusive products. embedding such good practice in the world-wide design and retail community. Studies show that by 2021, half the adult population in the UK will be over 50 years old and that similar trends are observable elsewhere. Such ageing populations are known to exhibit an increasing divergence in physical capabilities, in general the population becomes less capable. At the same time, the products that we use everyday seem to become ever more complex. Whether this trend is true or not, it is evident that products make demands of their users. One of the steps to ensuring that designs are as genuinely inclusive as possible is to provide metrics for defining the level of inclusivity attained for a given product. However, while it is useful to know who and how many can use the product, that information will not provide guidance on how to include more. Conversely, knowing who and how many people cannot use the product and why they cannot do so immediately highlights the aspects of the product that need to be improved. For example, if a product excludes a significant proportion of the population because the users either cannot hear or see the output from the product, then designers know to re-design the features involved in providing the output to the users. A Igreja do Bonfim, uma das mais tradicionais da Bahia, conta desde o domingo, 10, com uma rampa de acesso para portadores de necessidades especiais. A obra cumpre as determina? ?es da Lei de Acessibilidade, como é conhecido o Decreto-Lei 5.296, de 2 de dezembro de 2004. A legisla? ?o regulamenta o atendimento às necessidades específicas de pessoas portadoras de deficiência no que se refere a projetos de natureza arquitet?nica e urbanística, de comunica? ?o e informa? ?o, de transporte coletivo, bem como a execu? ?o de qualquer tipo de obra, quando tenha destina? ?o pública ou coletiva. A igreja que ficou conhecida pela tradicional lavagem das escadarias que já ocorre há mais de 260 anos, onde baianas lavam com água de cheiro os seus degraus, foi erguida a partir de 1745, ano em que chegaram as imagens do Senhor Jesus do Bonfim e de Nossa Senhora da Guia, trazidas de Portugal. A obra foi concluída em 1772. The Center for Assistive Technology and Environmental Access (CATEA) is a project of the Georgia Institute of Technology, College of Architecture. One of their innovative projects involves aquarium accessibility for blind visitors. CATEA is a multidisciplinary research center devoted to enhancing the lives of people with all levels of ability functional limitations through the development and application of assistive and universally designed technologies. Rather than focusing on disability, seeing people as "disabled," we believe that the limitations of current technologies and the design of the built environment account for the difference between any individual's potential and his or her ability to perform activities and participate in society. We seek to minimize those limitations. Georgia Tech researchers are using music to aid the visually impaired in understanding the movements and displays featured in aquariums, zoos, museums and other dynamic facilities. The research is using technology that tracks movements; in the case of an aquarium, it tracks the fish and interprets the movements into music and automated commentaries and narrations. "We have three main components to this research," said Bruce Walker, associate professor in the School of Psychology and the School of Interactive Computing at Georgia Tech. "The first is tracking the animals, the second is interpreting it into music and the third is making a seamless and interactive human experience." Next time you are traveling on the North Island of New Zealand and find yourself near Stanmore Bay or in Whangaparaoa you might drop in and see what Michael Erasmus has in the oven. Quite literally, he can't. Michael's pies are 1.1kg and made from fresh ingredients, no monosodium glutamate, food colour, enhancers or preservatives. "There's steak and kidney, steak and mushroom, mince and cheese, smoked chicken, chicken veloute and a vegetarian pie. It's all real food and quality is my focus," says Michael. Scuba Works dive shop in Jupiter, Florida is now a member of the Handicapped Scuba Association (HSA). The shop has recently certified their instructors to be able to teach scuba diving to handicapped candidates. The HSA has over 4000 instructors worldwide and is considered the leader in Handicapped Scuba Training. Their mission is to improve the physical and mental status of handicapped persons wanting to learn to scuba dive. Scuba Works owner, John Dickinson, says," We wanted to be able to work with handicapped student divers and are pleased the training was available through the Handicapped Scuba Association." In January of 2009, Rob Murphy, a local diver was struck by a private boat while scuba diving and lost both of his legs. The accident helped put a face on the handicapped divers and put a long overdue plan into action. In less than two months, Rob, an avid diver and spearfisherman, was back in the water diving and hunting. Stephen Metcalf, a HSA Instructor at Scuba Works is working with the Wounded Warrior Project to be able offer scuba diving to combat wounded veterans. "There are over 3000 disabled veterans, mostly lower leg amputees from IED explosions, which can benefit both mentally and physically from scuba diving," Stephen explained. Scuba Works is the only shop in the area to offer courses in Open Water Certification for Disabled Divers, Underwater Hunting for Disabled Divers, Underwater Diver Propulsion Vehicle Training and Dive Buddy for disabled divers. a unos fondos europeos incluidos en el programa de Cooperación Transfronteriza Espa?a-Fronteras Exteriores 2007-2013. En total, el Ayuntamiento de Málaga ha obtenido financiación para cinco iniciativas realizadas por el Servicio de Programas. El importe de esas actuaciones es de 3,4 millones de euros, de los que el 75% son fondos Feder. Los proyectos los comparte Málaga con las ciudades marroquíes de Tánger, Tetuán, Nador y Alhucemas, fruto de la colaboración que mantiene el Consistorio con municipios del norte de Marruecos. En la renovación integral de Cisneros, Especería y Salvago se acometerá su reurbanización para dotar a estas vías de una nueva configuración formal, basada en criterios de dise?o universal y en la mayor calidad de su pavimento y de los elementos de mobiliario urbano. En el caso de Salvago, las actuaciones que se harán requerirán un especial tratamiento en conjunción con la peque?a placita que se abre en la calle Compa?ía, justamente delante de la entrada principal al museo de la Fundación Thyssen. Para Cisneros y Especería se propone una utilización flexible del espacio. El objetivo es que sea una calle dise?ada expresamente para permitir la coexistencia del tráfico con el uso peatonal. Con un mejor aprovechamiento del escaso espacio de esa arteria, que va del pasillo de Santa Isabel a la plaza de la Constitución, se logrará una mayor integración con su entorno. Los materiales que se emplearán en la reforma serán semejantes a los de la calle Granada. Por su parte, la calle Salvago y el tramo de la calle Compa?ía comprendido entre ésta y la plaza de Constitución se redise?ará en su totalidad, con una concepción similar que, al mismo tiempo que su regeneración, busca una integración coherente con los espacios públicos colindantes (plaza de la Constitución). El proyecto contempla también la renovación de los servicios urbanos de las tres calles, así como completar esa infraestructura con las canalizaciones necesarias para futuras instalaciones de cámaras de videovigilancia, contenedores soterrados, red de baldeo y un red de tomas de energía eléctrica en baja tensión para el suministro a eventuales puntos de exposición que se hagan en la vía pública al amparo del Museo Thyssen. En la calle Cisneros las aceras se pavimentarán con losas de piedra de Santa Elvira, diferenciando, mediante cambios de dise?o en las baldosas, las franjas para el tránsito exclusivamente peatonal en los laterales y el uso compartido en la zona central, que estará separada de las laterales con un caz (canal) del mismo material. Las franjas laterales tendrán un color uniforme y estarán formadas por tacos de piedra natural de diez por diez centímetros. Ese despiece se adapta mejor a la traza y desviación de las alineaciones. En la zona central se configurará un despiece formado por losas de color gris de veinte por treinta centímetros. En la calle Especería, se mantendrá la continuidad de las bandas de Cisneros, pero cambiando el tipo de material. Se emplearán losas de travertino rojo (similares a las de la plaza de la Constitución) y piedra natural de color crema Huéscar. Este mismo material, pero con despieces diferentes en su sección transversal, se proponen para la calle Salvago. También en la de Compa?ía se utilizarán ambos materiales. El importe de la reforma integral de Cisneros, Especería y Salvago es de 1,5 millones de euros, de los que 1.125.000 euros son de aportación comunitaria. Esta actuación es la continuación del proceso comenzado hace más de 15 a?os para dotar al centro histórico de Málaga de una imagen de calidad acorde con su importancia y con una orientación hacia un uso preferentemente peatonal. La renovación de estas calles se deriva de su proximidad y conexión con la plaza de la Constitución, que representa el epicentro del centro de la ciudad. With photos from the second half of the past decade here is a photo essay on what sights there are to see from a wheelchair with the help of friends and the investment of industry stakeholders. R. Ramasamy (42), an MBA graduate and practising lawyer, who was paralysed below his waist about 17 years ago, will drive again, thanks to the Madurai Bench of the Madras High Court. Despite his condition, Mr. Ramasamy wanted to drive. He approached an automobile mechanic to modify his car as well as a two-wheeler. He wanted the clutch, brake and accelerator to be operated with hands. The mechanic obliged -- he mounted the acceleration control on the gear shaft and placed the brake control, using a lever, below it. The clutch could be activated by pushing down the lever attached to the gear rod. His two-wheeler did not have to undergo much alteration, but for attaching two extra wheels. Even as the lawyer was looking forward to drive, Regional Transport Officials here refused to register the vehicles without the approval of the Automotive Research Association of India, Pune. The ARAI informed him that approval could be given only to company manufactured vehicles. The lawyer filed a writ petition before the Madras High Court Bench here. Accepting his arguments, Justice Prafulla Kumar Misra held that government officials could not refuse to register vehicles altered by local mechanics to suit the needs of physically challenged or to issue driving licence for such vehicles. "A manufacturer of a particular type of vehicle may not think of manufacturing 'invalid carriage' (vehicle for physically challenged) on account of economic factors such as lack of demand... Even assuming that invalid carriages were still being manufactured, I do not find any restriction in altering a normal vehicle and re-registering it," he said. The officials were directed to consider the lawyer's applications for registration as well as driving licence afresh in the light of the observations made in the order and to take an appropriate decision within four weeks. 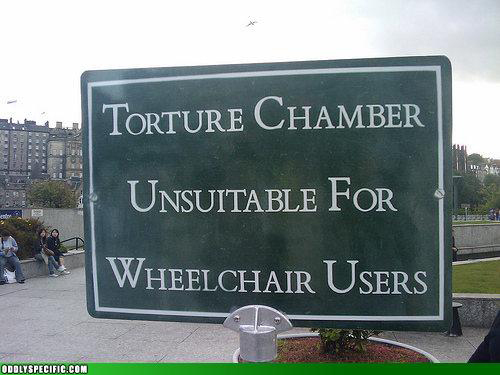 Another Inaccessible Torture Chamber: A Better Year in 2010? This photo makes you scratch your head and ask, "What in the world were they thinking?" From the web site Oddly Specific where the visitor comments are almost as funny as the sign! OECD - Paris, 4 May 2009 -- The French spend more time sleeping than anyone else in OECD countries. They also devote more time to eating than anyone else and nearly double that of Americans, Canadians or Mexicans. The Japanese sleep nearly an hour less every night than the French and also spend longer at work and commuting than they do indulging in leisure activities. These are some of the insights into the differing ways in which OECD countries use that most fundamental of resources, time, in the latest edition of Society at a Glance. Society at a Glance gives an overview of social trends and policy developments in OECD countries using indicators taken from OECD studies and other sources. It attempts to help people see how their societies have changed, particularly in comparison with other countries. A special chapter in the report investigates leisure time in the 18 OECD countries for which up-to-date time-use surveys are available. The time-use surveys included in this report are from 2006 and based on nationally representative samples of between 4000 and 200000 people. The report reveals big differences in the amount of time men and women have for leisure. Italian men have nearly 80 minutes a day of leisure more than women. Much of the additional work of Italian women is apparently spent cleaning the house. Norway is the most equal society, with men having only a few more minutes of leisure than women. Norwegians spend just over a quarter of their time on leisure, the highest among OECD countries, while Mexicans spend just 16%, the lowest. So what are we doing with our leisure time? Watching TV absorbs 55% of leisure time in Japan and falls to a low of 25% in New Zealand. Turkey is the most sociable nation, spending 35% of leisure time entertaining friends, more than double the OECD average of 11%. But OECD countries are not very physically active: Spain reports the highest proportion of leisure time spent doing regular physical activities. Even there, exercise accounts for a mere 13% of leisure time. Other social indicators covered in Society at a Glance include adult height, fertility rates, education spending, income inequality, obesity, healthcare spending and life and work satisfaction. Por mais de 50 anos o paradigma da integra? ?o social nos guiou na elabora? ?o de políticas e leis e na cria? ?o de programas e servi?os voltados ao atendimento das necessidades especiais de pessoas com deficiência. Consiste em adaptarmos as pessoas com deficiência aos sistemas sociais comuns e, em caso de incapacidade por parte de algumas dessas pessoas, criarmos sistemas especiais separados para elas. Neste sentido, temos batalhado por políticas, programas, servi?os e bens que garantissem a melhor adapta? ?o possível das pessoas com deficiência para que elas pudessem fazer parte da sociedade. Por este paradigma, a sociedade continua basicamente a mesma em suas estruturas e servi?os oferecidos, cabendo às pessoas com deficiência serem capazes de adaptar-se à sociedade. Este paradigma n?o mais satisfaz a compreens?o que adquirimos recentemente a respeito de como deve ser a inclus?o, que consiste em tornarmos a sociedade toda um lugar viável para a convivência entre pessoas de todos os tipos e condi? ?es na realiza? ?o de seus direitos, necessidades e potencialidades. Ent?o podemos citar como alguns princípios básicos da inclus?o a celebra? ?o das diferen?as, direito de pertencer e a valoriza? ?o da diversidade humana. Algumas empresas e organiza? ?es ligadas ao turismo já vem aplicando o conceito de Turismo para Todos, ou Tourism for All como é denominado em inglês. Este conceito tem como base a inclus?o, considerando que o turismo é um direito de todos, e que n?o deve haver diferen?as na forma de tratamento de qualquer tipo de pessoa, respeitando suas características particulares. Somente refor?ando, a deficiência é uma característica da pessoa, pois é algo que pertence à pessoa, assim como a preferência de alguém por comidas naturais, ou o medo de locais fechados, também s?o características pessoais, ent?o devem ser respeitadas e n?o vistas como um defeito ou impedimento. Importante é n?o confundir inclus?o com integra??o. Um hotel, por exemplo, que possui uma parte de seus quartos adaptados. Isso é integra??o. Inclus?o seria a pessoa com deficiência poder escolher qualquer quarto do hotel. No fundo integrar também é um ato de discrimina? ?o, afinal o ato de discriminar tem a ver com a separa? ?o e distin??o. Possuir todos os quartos com acessibilidade, permite que as pessoas com deficiência n?o fiquem dependentes de um local diferenciado, pois em algumas situa? ?es reais pelas quais eu já passei, havia vagas no hotel, porém os quartos adaptados estavam ocupados por pessoas que n?o possuíam nenhum tipo de deficiência. Embora n?o se configure uma inclus?o total, a orienta? ?o pelas normas de acessibilidade, exigem que 5% do total de quartos sejam adaptados. 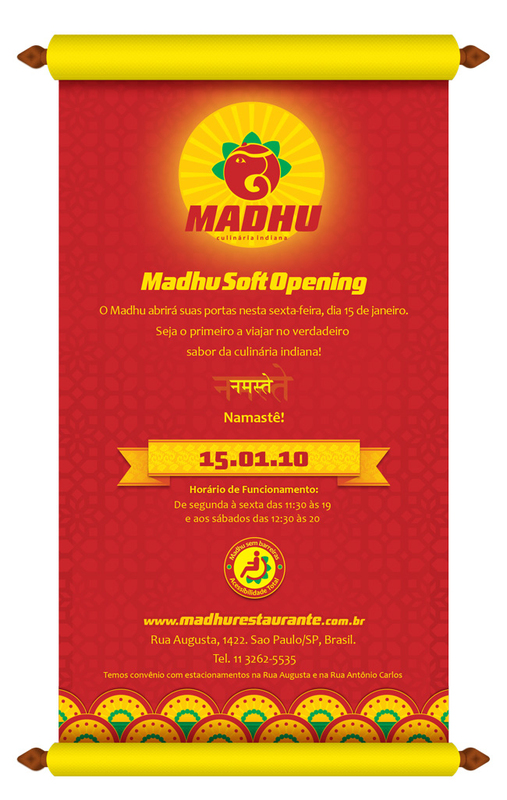 Mesmo se o estabelecimento quiser seguir somente essa orienta? ?o, a acessibilidade deve atingir a todas as diferentes classes de quartos que o hotel possui (geralmente denominadas como standard, luxo, executivo, etc. ), para que assim esteja em conformidade com a oportunidade de escolha. O turismo também envolve servi?os, onde a quest?o da inclus?o também dever ser contemplada, mas para isso necessita de um olhar mais treinado, para que detalhes às vezes aparentemente pequenos, mas de grande importancia, n?o passem desapercebidos. Somente prover o acesso físico em uma central de informa? ?o turística, n?o é contemplar a inclus?o. Este tipo de servi?o deve prestar aten? ?o naquilo que oferece, pois por exemplo, indicar um teatro, restaurante ou hospedagem para um usuário de cadeira de rodas, sem que este mesmo n?o tenha acessibilidade é n?o prestar aten? ?o nas características da pessoa, e desta forma o servi?o pode se tornar sem efeito, além de trazer desconforto ou complica? ?es para o cliente que o procurou e até para o estabelecimento visitado. O Código de ética Mundial para o Turismo, da Organiza? ?o Mundial do Turismo (OMT), menciona que as atividades turísticas devem respeitar a igualdade entre homens e mulheres, devem tender a promover os direitos humanos e, especialmente, os particulares direitos dos grupos mais vulneráveis, especificamente as crian?as, os idosos, os deficientes, as minorias étnicas e os povos autóctones. Além disso, também diz que o turismo das famílias, dos jovens e estudantes, das pessoas idosas e dos deficientes deverá ser encorajado e facilitado. Fazendo um jogo com o significado desta palavra polêmica, a partir do momento que o trade turismo se movimentar, enxergando a pessoa com deficiência como um grande cliente em potencial, estará incluindo em sua empresa um posi? ?o mais respeitada perante a sociedade, além de mais uma fonte de dinheiro para alimentar seu caixa.